You are currently browsing articles tagged Celts. The Lia Fail with the Mound of the Hostages in the background. On top of the Hill of Tara, in the middle of the rath known as An Forradh, “The King’s Seat,” there stands a large carved stone. 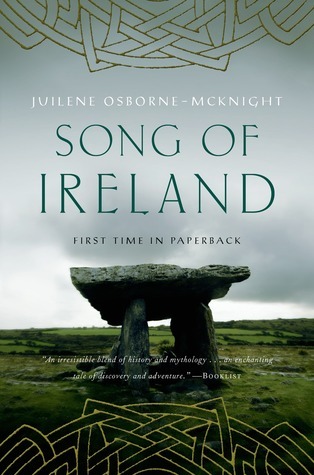 This is the Lia Fail, the stone of destiny, one of the powerful totems the Tuatha de Danaan, the god-like ancestors of Irish Myth, are said to have brought with them to Ireland. 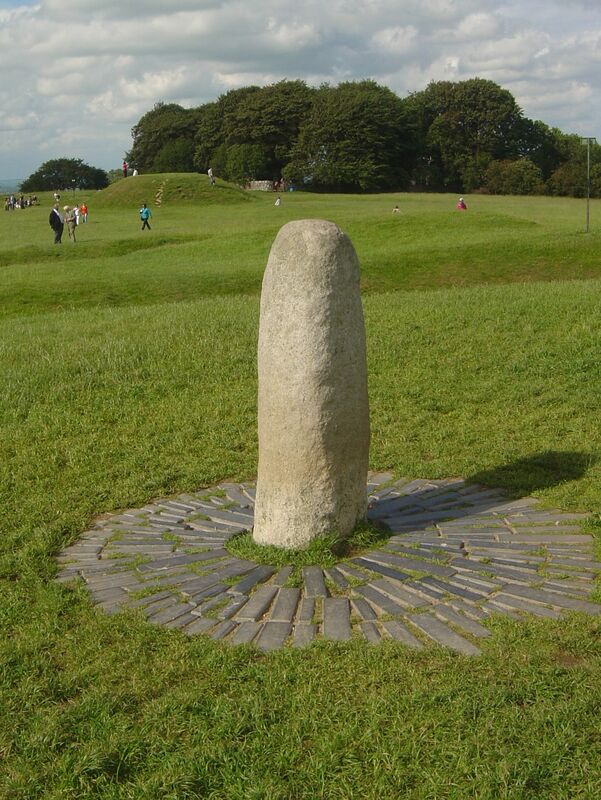 Legend has it that when the kings of Ireland assembled at Tara to choose a new Ard Ri, or High King, the stone would shout its approval when the candidate touched it. 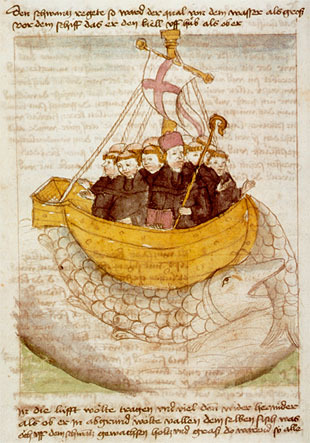 This was one of what appear to be several trials a would-be High King had to pass. 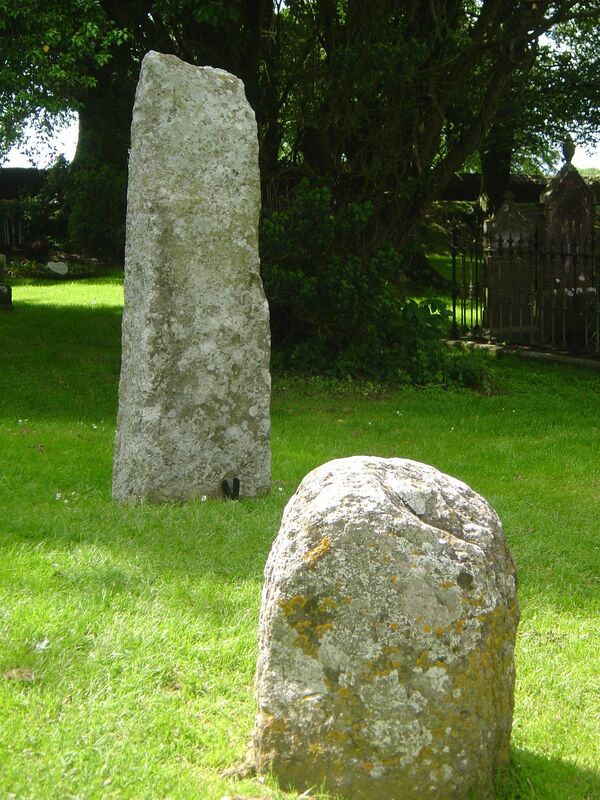 Two standing stones in the churchyard of St. Patrick’s Church on the Hill of Tara. Another was driving his chariot through two nearby standing stones which would jump out of the way if he was worthy. There were traditionally a number of standing stones around the hill, but few now remain (at least overground). Two still stand side by side in the adjacent churchyard — one featuring a very-weathered sheela-na-gig carving. However, there does not appear to be space between them to drive a chariot through. The Lia Fail originally stood near the Mound of the Hostages, but was moved to its present position in 1798, to mark the graves of 400 rebels who were buried on the hill after a battle. Whether this is the real Lia Fail or simply one of the other standing stones the annals tell us stood around the Hill of Tara is a matter of some conjecture. One theory holds that the original Lia Fail was stolen and brought to Scotland, where it became known as the Stone of Scone, and has been used to crown Scots and English monarchs ever since — Oh, we Irish never tire of bashing the English. Another story holds that the real Lia Fail was hidden away for safekeeping until Ireland is ready for a High King again — if so, it’ll have a long wait. This is the third part of a series looking at the Hill of Tara. 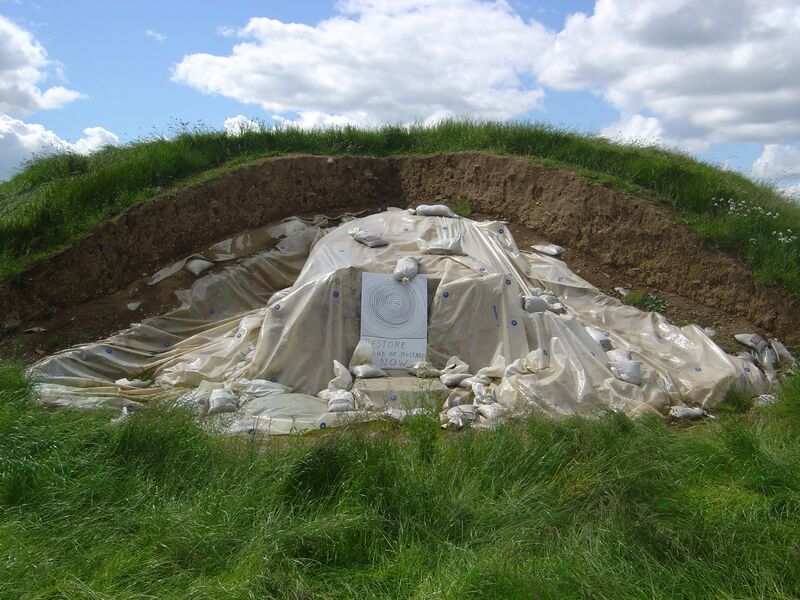 The Mound of the Hostages in 2009, before the current restoration project. The oldest — and perhaps most important — monument on the Hill of Tara is the misleadingly named “Mound of the Hostages,” a neolithic passage tomb of a much smaller scale than Newgrange (which is visible from the top of the hill on a clear day — but you’ll need binoculars). Due to the thick metal bars on the entrance, generations of Irish schoolchildren (and tourists) came away from brief tours of the hill erroneously assuming that this was a prison mound. 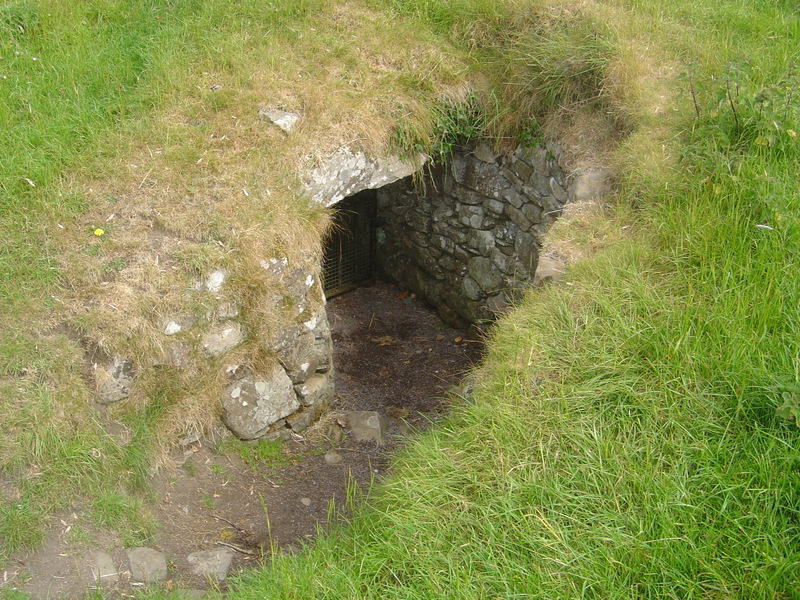 This small tomb is similar to the satellite tombs that surround the principle cairns at Loughcrew, Newgrange and Knowth, but in rather better condition. The passage is very short (about 13 feet) and the chamber is simply where the passage deadends, rather than an elaborate cruciform chamber with carved bowls like some others. Despite its relative simplicity, the passage has a solar alignment, this time with the “cross-quarter” days (Feb. 4 and Nov. 8) which correspond to the Celtic festivals of Imbolc and Samhain, and boasts some fine carved rocks. 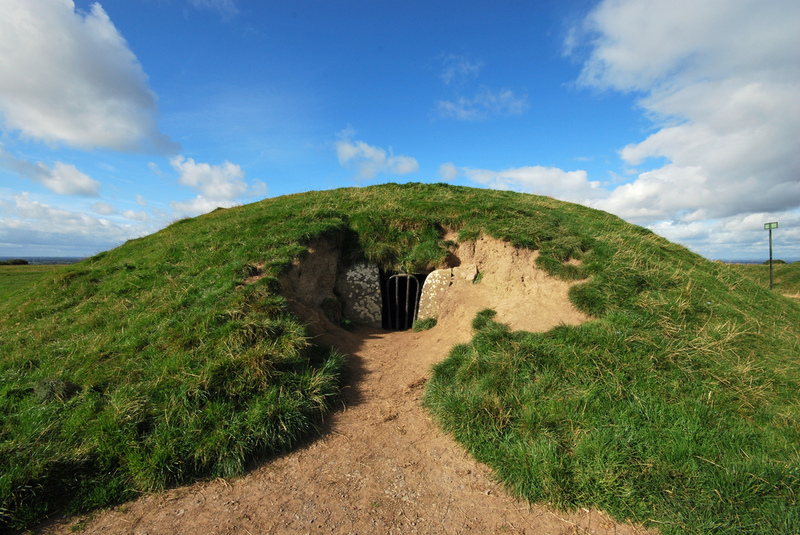 Unlike Newgrange, which controls access to the chamber at the solstice by lottery, anyone can walk up to the Mound of the Hostages and observe the solar alignment through the bars on cross-quarter days — weather permitting! 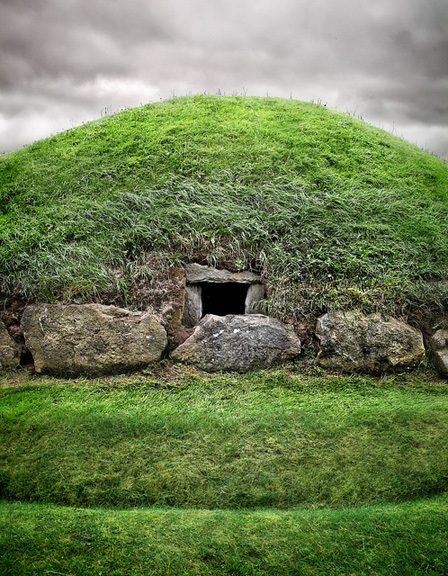 The tomb is called the Mound of the Hostages/Dumha na nGiall after one of the most-famous High Kings of Ireland, Niall Nolligach, who — like all Iron Age kings — took members of other royal families “hostage” to deter aggression, hence his nickname, Niall of the Nine Hostages. The iron bars on the tomb entrance gives the misleading impression that these hostages were thrown into the tomb to rot, but the truth is that the main tribes of Ireland sent children to be fostered by other leading families to create alliances and engender goodwill, so treating them that harshly would rather have defeated the purpose. The Mound of Hostages during reconstruction (June 2012). The exposed orthostats and lintels have been protected from the elements with plastic sheeting. 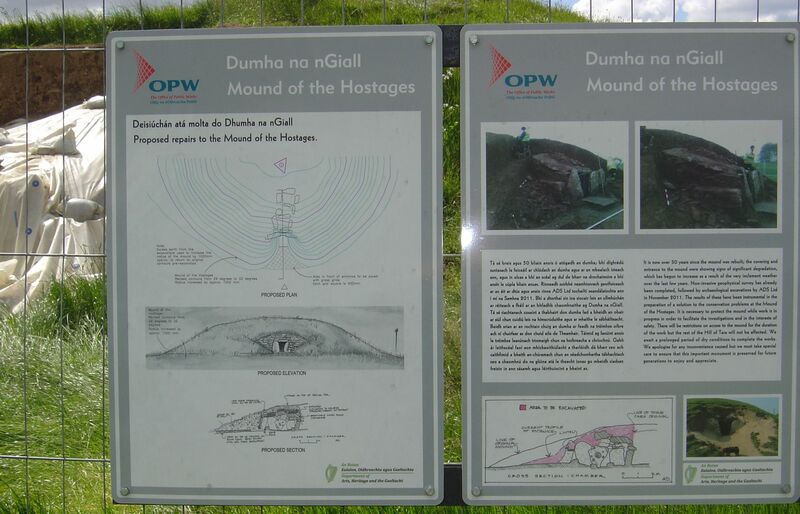 One striking fact about the Mound of the Hostages is that it remained in use centuries after all the other passage tombs had fallen into disuse. Whatever the exact reasons for this change in burial practice were, it appears that Tara was considered more important than the other tombs; when the mound was excavated in the 1950s, the volume of human remains filled the passage and chamber almost to the roof. Indeed, archaeologists have found that our ancestors began interring people in graves around the mound at a certain point; whether this reflects new beliefs or the simple fact that the tomb had reached capacity is open to debate. In late 2011, the National Monuments Service began work to stabilize and repair the front of the mound. The two slopes adjacent to the entrance had become very eroded, and the integrity of the structure was judged to be at risk. Workers removed the earth covering the passage and chamber, affording visitors an unparalleled look at the construction of the passage. Needless to say, this work was very controversial (note protest sign in the photo above right), not least because it began on the day of the winter alignment and blocked the solar alignment during the time when work was underway. (The workers charged with carrying out repairs are said to have had no idea about the alignment — although I learned that nugget of gossip from the protestors, so take with a pinch of salt — which, if true, reminds us of how little-appreciated this monument is.) I have not been able to visit the site thus far in 2013, but a recent picture (below) shows the new facade close to completion. Doubtless there will be a sustained argument over the integrity of the interpretation, as still continues over Newgrange. The almost-complete new facade of the Mound of the Hostages in spring 2013. Explanatory signage detailing the reasons for reconstruction which was erected during the 2012 conservation work. Click through to a higher resolution image if you want to read the text. 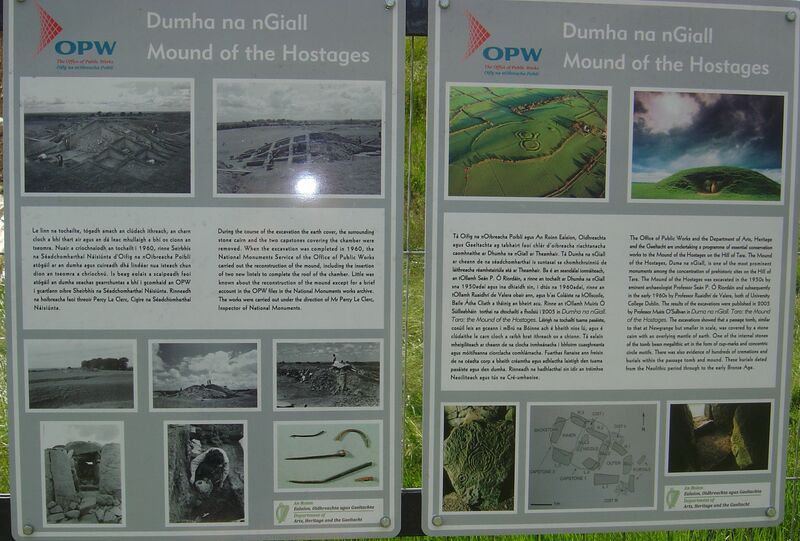 Interpretive signage erected during the 2012 conservation work at the Mound of the Hostages. Click through to a higher resolution image if you wish to read the text. You can wander around the church and friary/college on top of the Hill of Slane all morning without noticing the mound known as “the motte” because it’s in a wooded area behind the church. I know I (who grew up in Co. Meath) didn’t even know it was there until I read about it somewhere or other. There now seems to be a very interesting project to investigate this mound under way. Archaeologists have been scanning the motte and its surroundings (an earth resistance survey) to discover what it’s made of (a cairn of rocks brought from elsewhere, a built structure, or a mound of local clay?) and detect any subsoil evidence of the remains of buildings on top. The resultant 3D mapping gives a great view of the physical features of the hill and suggests future locations to explore. 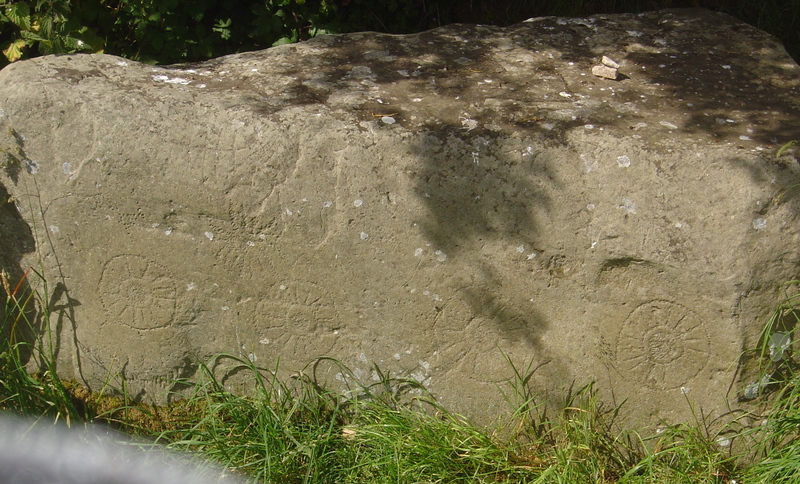 Going by the annals, it seems likely that there was an ancient grave of some importance on the hill: reputed to be the Fir Bolg king Sláine, from whom the hill gets its name. (Yes, that’s the same Sláine on whose legends the classic 2000AD comic was inspired. I daresay a generation of British and Irish megalithomaniacs had their imaginations kick-started by that story.) 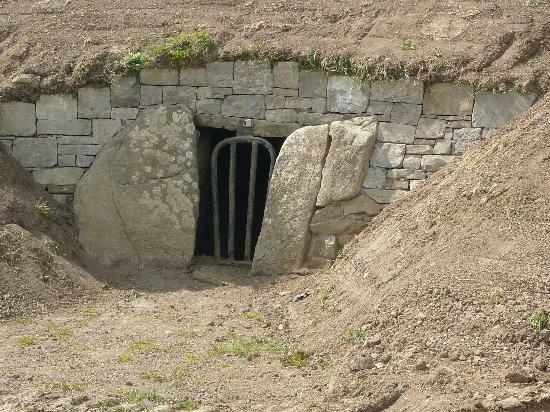 The type of grave this may have been (cairn, passage tomb, dolmen, etc.) we don’t know. Likewise, whether that grave site was later exploited to build a Norman motte and bailey-type fortified position or whether the church was originally built on the tomb site is unknown. It seems the use of the motte as a fortified position dates from around 1170AD, but the mound now known as the motte could be much older. 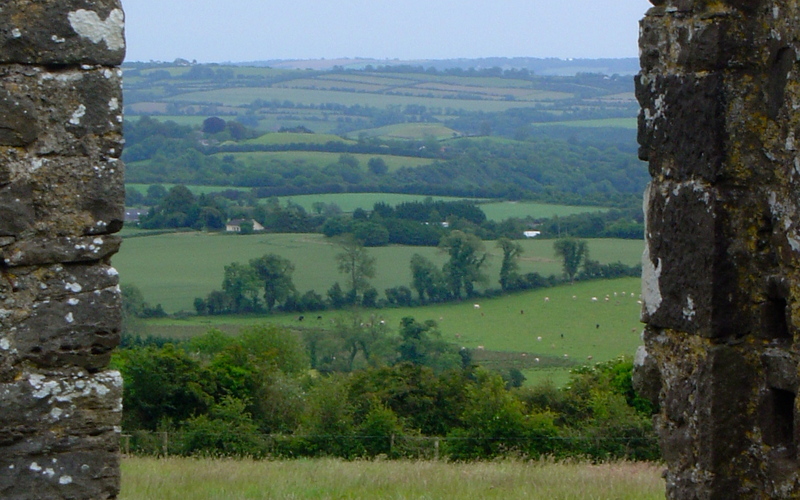 Sláine was reputed to have cleared the site for Newgrange, which would place him circa 3200BC. 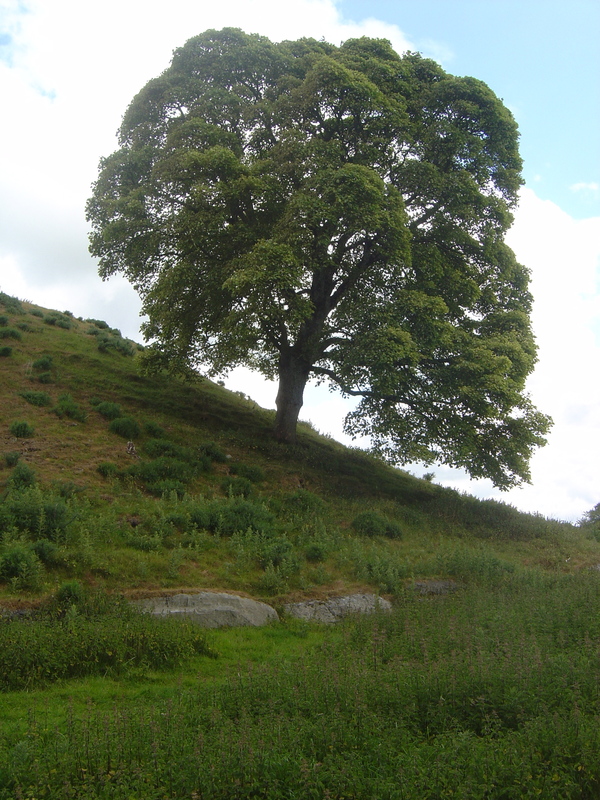 However, the preliminary earth resistance survey results from this project are intriguing, suggesting that the mound is man-made and revealing a second earthwork (possibly a ring barrow dating from 2500BC–although all dates seem approximate at this stage in the project) partially overbuilt by a rath surrounding the motte. Given the history of adaptive re-use of sites with strategic or symbolic significance by successive cultures in Ireland, there certainly seems to be a strong case for further investigation. Fieldwork has been ongoing since 2010, so this is a project to bookmark and watch for future discoveries. 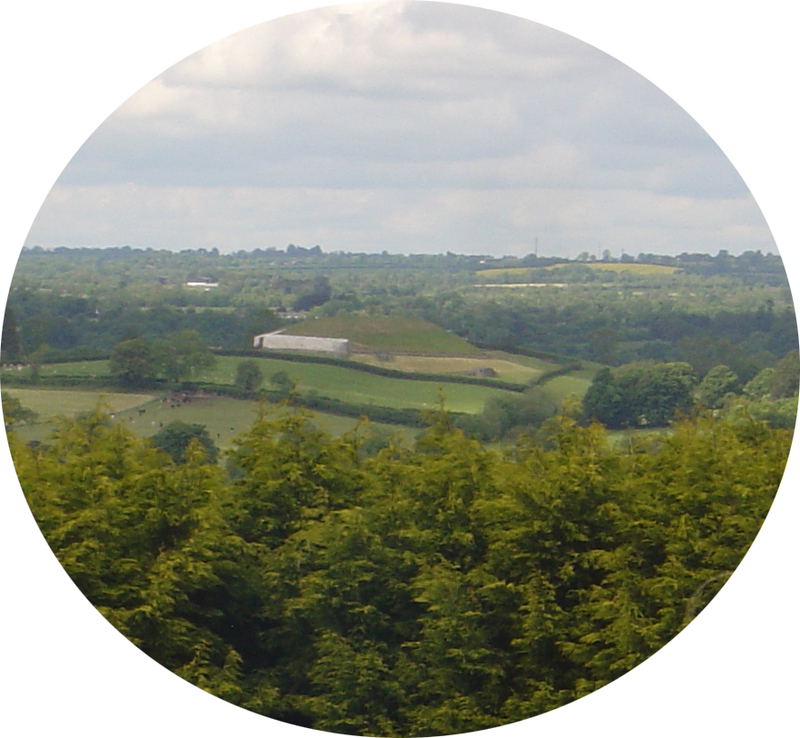 2010 Research « The Hill of Slane Archaeological Project.